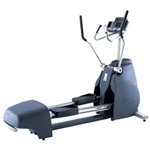 The StarTrac EE4600 Natural Runner makes it easy to achieve a total-body cardio workout. A milestone in its development, this piece of equipment is the first self-powered, non-impact trainer to offer runners a true body-friendly alternative. Exercisers will instantly warm to its Quick Start button convenience, multiple personal training studio program options, and the patented user-friendly sport utility display. Extra Information: First developed machine of its kind as a self- powered unit ”Natural Runner” is the closest thing to a natural run with practically no impact.